To see the Universe in full, astronomers have to get creative. They combine multiple photos taken by different cameras to make one colourful picture. For example, in this beautiful new picture of a star-forming cloud, the space telescope called Chandra only captured the purple regions. Meanwhile, another space telescope called Spitzer saw things a bit differently when it observed the same cloud - everything shown here other than the purple bits! But why don't these two telescopes see the star-forming cloud in the same way? The answer lies in the type of light that the telescopes are designed to observe. Our eyes can only see visible light. But there are many other types of light that can be detected by special telescopes, such as infrared, ultraviolet and X-ray. For example, the Spitzer telescope detects infrared light. Spitzer is perfect for observing dusty star-forming regions, as infrared light can travel through the dust. The Chandra telescope, however, can't see infrared light. Instead, Chandra can detect the X-ray light that is given off by gas when it is heated to incredibly high temperatures by hot, young stars. So, although the two telescopes give a different tale about what they see, they're both telling the truth! 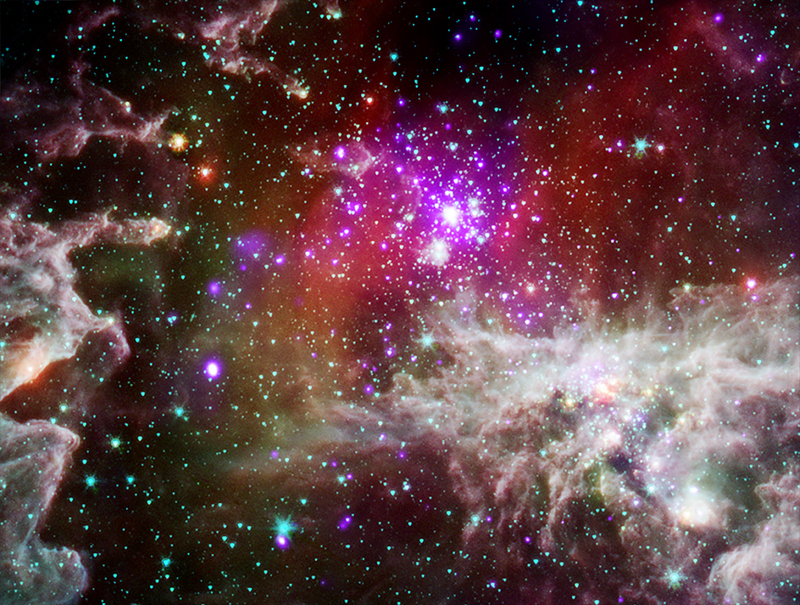 Cool fact: The hot gas in this image (shown in purple) has a scorching temperature of 10 million degrees Celsius!